Despite the snow still lingering on the ground, Beacon elementary students are already starting seeds and planning for spring. It’s happening under a program run by Hudson Valley Seed. a local organization dedicated to educating children in nutrition and wellness through curriculum-integrated garden learning. In the last few weeks, students at South Ave, J.V. Forrestal, and Sargent have planted basil and graphed its growth, studied soil, learned about adjectives, sowed kale seeds, and more. “Each week students learn about what it means to observe,” says Hudson Valley Seed’s executive director, Ava Bynum. Children use their sensory perception to study soil, then make lists of adjectives to describe what they see, smell and touch. They measure the basil sprouts poking up from containers in classrooms around the district, making a record of how much the basil grows each day. After studying soil and planting kale this week, the students read observations from their garden journals. Listen to one student’s response here. 1. Stay tuned for upcoming community garden work days, where you can come help out and get your hands dirty. These will be listed in the Wigwam Events Calendar. 2. Donate to Hudson Valley Seed to help us meet the demand from new school districts who want to be involved in garden education. 3. Email volunteer@hvseed.org if you would like to get involved. We need your support and there are jobs for every skill set. Feature photo courtesy Hudson Valley Seed. 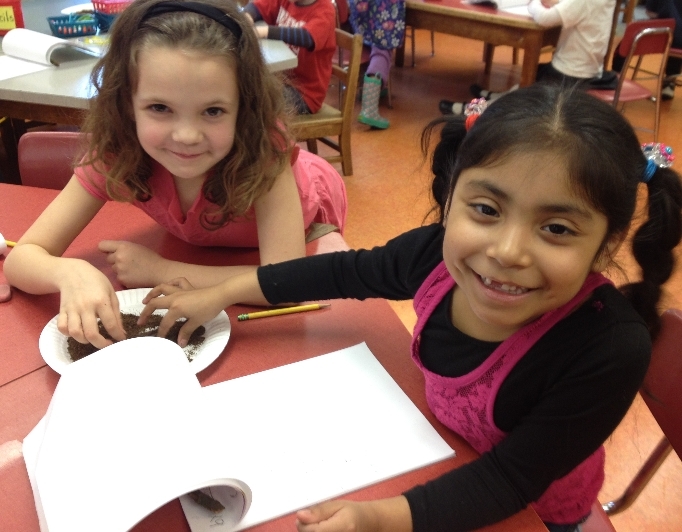 Elementary school kids learn about soil composition using the senses. That’s my niece Fallon! Nice photo, and it’s great to hear children are learning how to grow their own food!